That’s one of my favorite cookbooks! I love Cristina’s recipes. 🙂 I haven’t tried a carbonara lately because of the uncooked egg (and my aversion to that!) but I’m enticed by your egg-free version! Carbonara is one of my favorites. This sounds great. i keep making carbonara thinking my kids will definitely eat it, and they push it around their plates without eating it every. single. time. it’s usually ok with me because then i get all the leftovers, but i’m always surprised…seems like a kid-friendly dish to me. glad my kids aren’t the only ones who won’t eat it. 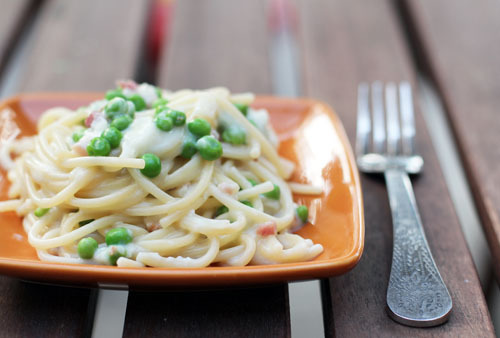 I love carbonara, and love that this has peas in it! This is going on the must make list! Very interesting way of preparing this dish. I need to try this – I know my family would love it! Carbonara is made with eggs! (This is an advice, not a critic). Eggs are the most important ingredients in this receipe! No peas, no milk and it is better to use dried pasta. P.S. I’m italian, from Rome, the home of carbonara! Okay, I am really sorry, but this pasta has nothing to do with carbonara… I’m not saying this tastes awefully, maybe it’s really good, but PLEASE don’t call it carbonara!! Carbonara is made with eggs, guancale (or pancetta for the easier version), pepper, salt and if you want some pecorino romano, and you use spaghetti… No milk, no peas, no shallot, no parmesan cheese! I don’t get it how you cuoldn’t include at least the most importanti thing for the carbonara, the eggs!? If you don’t know how to make carbonara then don’t call your self-created dish carbonara because it looks like it for you! As for the Italian’s making the comments in regard to egg’s and carbonara..I would love to have this dish made the “REAL ITALIAN WAY” ……BUT iam highly allergic to eggs, and become violently ill when I eat anything with egg in it ( or by themselves ) SO with that being said…Iam grateful for people like Jane who have modified “carbonara” recipe’s WITHOUT egg so I can at least PRETEND iam eating the real thing! 🙂 Thanks Jane! has anyone tried subbing non-dairy milk? I personally have not, so no experience to share. sorry! Hey, i was wondering if you could sup in bacon instead of pancetta? i was going to make this for siblings and parents but my siblings dont like pancetta? is this ok? Ys. We all know the carbonara sauce has eggs in it. This recipe is also intended for allergic people to eggs and I thank this website I found this for my son whose eggs allergy is really bad! The ones who have no problems with eggs can put them in it! It is an awesome alternative…. Italians always need to come off like they are so special in a rude way. Love this dish. This recipe was……Shite. The sauce done that way seperated and I ended up with clumpy cheesy onions and veg and yellow liquid that just didnt turn into a sauce. WTAF. Never avoiding my instincts to make a rue and opt for the “FAST WAY” of doing things EVER AGAIN. Terrible recipe. That is too bad the sauce didn’t come together for you – it did come together fine for me, so not sure what to say. but I agree using a roux is always very reliable. good luck with other recipes! 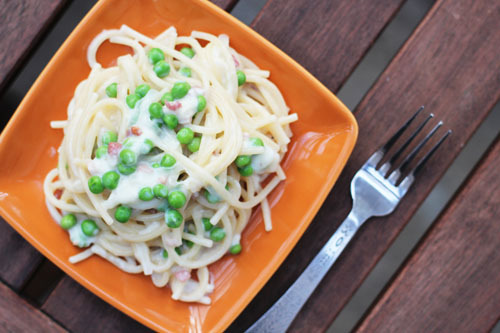 Making this tonight (minus the peas) and using ground beef instead. Great recipe! 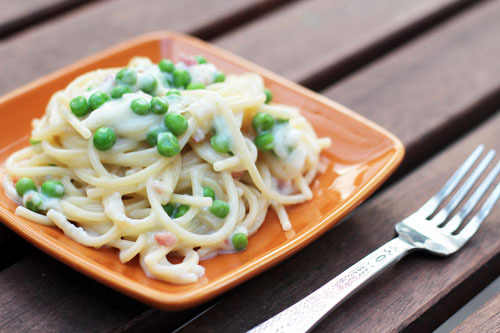 This looks really good but sadly i dont have parmesan cheese is it good to use cheddar cheese? probably would work, it will just be more like a mac n cheese dish rather than a carbonara dish, but I’m sure would taste good. that said I haven’t ever done it with cheddar. if you do try it, let us know how it goes!